Cross section of PTH repair using an eyelet. Even in today's high tech world, there are still thousands of circuit boards being used that were (and are still being) made with through hole technology. Experience tells me that many of these through hole circuit boards will need a plated hole repaired at some point. Procedure 5.1 Plated Hole Repair may be the one that will save your irreplaceable electronic assembly. As good as this procedure is, there is one section that may cause even the most experienced repair technician some head scratching; it is how to select the right eyelet. I direct you to "eyelet selection criteria" section of the procedure. Eyelet press used to set eyelets. The outside diameter ot the eyelet should allow the eyelet to be inserted into the drilled hole without force, but should not exceed 0.125 mm (0.005") greater than the eyelet outside diameter. 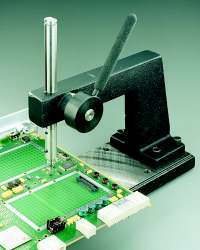 Eyelet presses are available specifically for setting eyelets into circuit boards.